A new book that chronicles a century of nursing education in the Glass City has been released by The University of Toledo Press. 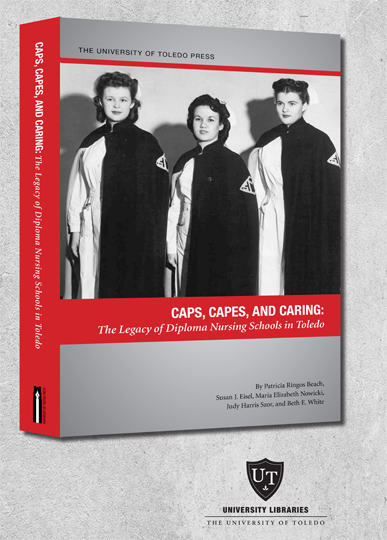 “Caps, Capes, and Caring: The Legacy of Diploma Nursing Schools in Toledo” was written by Patricia Ringos Beach, Susan J. Eisel, Maria E. Nowicki, Judy Harris Szor and Beth E. White. Mulford Library on Health Science Campus will host a book launch Wednesday, May 23, from 4:30 to 6:30 p.m. on the fourth floor of the library. Signed copies of the book will be available for purchase, and the authors will be present to speak with attendees. Between 1893 and 1999, there were eight hospital-based diploma schools of nursing in Toledo: Flower Hospital School of Nursing, Maumee Valley Hospital School of Nursing, Mercy Hospital School of Nursing, Riverside Hospital School of Nursing, Robinwood/St. Luke’s Hospital School of Nursing, St. Vincent Hospital School of Nursing, Toledo Hospital School of Nursing, and Toledo State Hospital School of Nursing. This core group of schools, operating for more than 100 years, sent registered nurses into the community to care for the sick and teach community members how to stay healthy. Graduates from these schools continue to provide care and comfort, and educate future nurses. The authors, all hospital diploma school graduates, taught together as nursing faculty at the Toledo Hospital School of Nursing. Beach, Eisel, Nowicki and Szor are alumni of MCO/MUO/UT, where they received advanced degrees in nursing and education. In the course of writing the book, the authors interviewed nearly 100 Toledo diploma school graduates. Their memories and stories are celebrated in the book, which also includes historical images and photographs. The book is $24.95 and available at utoledopress.com. Light refreshments will be served at the free, public event. For more information on the launch party, contact Jodi Jameson, assistant professor and nursing librarian at Mulford Library, at jodi.jameson@utoledo.edu or 419.383.5152. This entry was posted on Wednesday, May 16th, 2018 at 3:58 am and is filed under Alumni, Events, Library, News, Nursing, UToday .